Coming soon, no doubt, to a pub quiz near you, the question: Who are the reigning Olympic Rugby Champions? It is one of those questions quizmasters love. You know it or you don't. Almost nobody is going to get it by an educated, playing-the-percentages guess. The answer is the United States of America, which made their 2007 World Cup clash with England at Lens Olympic Champions v World Champions, just about the only distinction it did possess. The circumstances under which they won the title at the Paris Olympics in 1924 help explain why they've held it ever since. Those are the games chiefly known in Britain for the 'Chariots of Fire' victories by sprinter Harold Abrahams and Scottish 400 yard runner - and seven-times capped international wing - Eric Liddell. The Americans, with a team based heavily on Stanford University in California, met France in the final at the Stade Colombes. France expected to win. They were fielding 12 of the team who had lost only narrowly to Wales in the Five Nations three months earlier, and had competed well throughout the tournament. Wing Adolphe Jaureguy is remembered to this day as one of the early giants of French rugby. Lock Marcel Lubin-Lebrere had lost an eye in the trenches and in the first postwar match found himself marking a similarly disabled Scot. It did not, though, go to plan. The US led 3-0 at the break and scored four more tries after the interval as heavy tackling derived from American Football intimidated and exhausted the French, winning 17-3. The French team took it well. The crowd did not. An American reserve was assaulted and both his team-mates and referee Albert Freethy, who a few months later would issue the first sending-off in international history when he dismissed All Black Cyril Brownlie, needed police protection. The 'Star Spangled Banner' was howled down as the medals were presented. It is little wonder that the International Olympic Committee decided it could live without rugby at the next games, in Amsterdam in 1928. It probably did not help that Pierre de Coubertin, a rugby enthusiast who had refereed the first ever French championship final, stood down as IOC president in 1925. Even he, though, might have struggled to make a case for a sport that provoked public disorder and had never attracted more than three competitors. In 1924 the other entrant was Romania, whose team had more experience of railway travel - four days in third class while crossing the continent - than international rugby and conceded 100 points to the two finalists. Nor should the USA's triumph have come as quite such a shock. They were, after all, the reigning champions after beating France 8-0 in the only match at the 1920 Antwerp games. That too, was a predominantly Californian team, the product of the brief period when a number of universities in the state, revolted by the violence of American football, had switched to rugby. Stanford had only gone back to the local game in 1919. They had some imported expertise - captain-coach Dave Carroll was an Australian international who had stayed on after visiting California on the way back from the fabled first Wallabies tour of 1908-9 - and serious pace. Team member Morris Kirkby also competed in the sprints and only just missed a gold in the 100 yards, losing to champion Charlie Paddock by an estimated 18 inches. The US led 3-0 at the break and scored four more tries after the interval as heavy tackling derived from American Football intimidated and exhausted the French, winning 17-3. The French team took it well. The crowd did not. Carroll supplied a link to the previous Olympic champions, Australia - who had won their title in the London games of 1908. Finding them an opponent was not easy. England, New Zealand and South Africa had rejected their invitations. Wales, Ireland and Scotland had not even bothered to reply, and France were a late withdrawal. In the end Great Britain was represented by Cornwall, that year's county champions. Fullback John Jackett, scrum-half Tom Wedge and outside-half Jim Davey would all play for England that season. Centre Bert Solomon's cap came later, in the first ever international at Twickenham, scoring the solo try that made sure of England's first win over Wales in 12 years before returning to Redruth and deciding he hadn't enjoyed international rugby and wouldn't be playing again. It is unlikely he enjoyed Olympic rugby much, either. The match was played on a wet, heavy pitch at the White City, the main games venue. The swimming pool ran down one touchline and mattresses placed around it to prevent injuries. A pole had to be used to fish the ball out. Australia won 32-3, with Carroll scoring two tries, but do not seem to have rated the event too highly. The tour captain Herbert Moran, who did not play in the match, later reckoned their greatest achievement had been getting through five months away without any of their players catching venereal disease. They were the second Olympic champions. The first had been France, eight years earlier in Paris. A team including Frantz Reichel, commemorated since 1931 by the French under-19 championship trophy, first defeated Frankfurt - representing Germany - then Moseley Wanderers, based largely on the Birmingham-based club, representing Britain. The two losers never met, but shared the silver medal. One might think that Rugby Union and the Olympics, which hung on to the ideology - if not invariably the practice - of amateurism longer than almost any other forms of international sport, would have been natural partners. 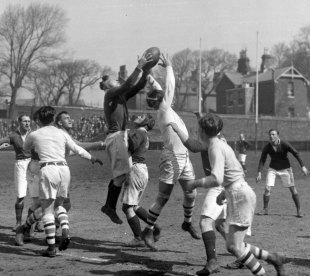 But rugby's limited base, and still more the deep distrust its rulers felt for multi-team tournaments - believing them the thin edge of the professional wedge - kept them apart. Olympic historian Ian Buchanan reckons that by far the best rugby tournament, in both standards and organisation, ever associated with a games was in Berlin in 1936. Classed as a demonstration event, it was played by members of the Federation International de Rugby Amateur - the vehicle used by the French both to develop continental rugby and ensure themselves competition while suspended after 1931 from the Five Nations. France beat Germany in the final after Italy and Romania had been eliminated in the semis. The International Board put a veto on participation at a tournament played in Rome at the time of the 1960 games. Nor did rugby do itself any good in 1976 when New Zealand's insistence on touring apartheid-era South Africa led to a 22-nation boycott of the Montreal games. That legacy of distrust has of course now ended with the introduction of sevens as an event for both men and women at the 2016 games in Rio de Janeiro. Too bad perhaps that there is no space for it as a demonstration sport over the next couple of weeks in London. So the time is at last ticking down on that quiz question, but the Americans - like many of rugby's developing nations - will attack an event that will also be regarded as the sevens World Championship with much more confidence than they have ever brought to the pursuit of the Webb Ellis Cup. And one nation in particular - Fiji, which has yet to win an Olympic medal of any colour - has reason to await Rio2016 with particular impatience.